Do more, faster than ever before with new TurboCAD® 17! IMSI/Design is excited to announce the release of TurboCAD Pro v17. New TurboCAD Pro is the most affordable solution for collaborative design, drafting, and detailing, and comes with improved speed, powerful new tools, and greater interoperability than ever before. Please note that there will not be a new version of TurboCAD Pro Architectural Edition and TurboCAD Pro Mechanical Edition, but that you will get the additional toolsets of these two products in new TurboCAD Pro Platinum v17. Also new is TurboCAD Deluxe v17. We're very excited about our new, turbo-charged drawing engine (which takes advantage of GPU-based graphics cards for lightning-fast wireframe display) and a host of new functionality improvements. Fewer clicks, less setup, and much more! Still the most affordable solution for collaborative design, drafting, and detailing, new TurboCAD 17 offers improved speed, powerful new tools, and greater interoperability than ever before! Let your creativity flow and draw what before you could only imagine. New & improved file filters give you better ways to collaborate with others. TurboCAD is a CAD software application for 2D and 3D design and drafting running on the Macintosh and Microsoft Windows operating systems. 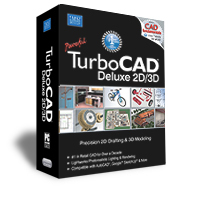 TurboCAD Deluxe Edition provides unlimited design options and includes hundreds of professional drafting and design tools, file support, video and interactive tutorials, photo-realistic rendering and pre-drawn drag-and-drop symbols. Beginner, intermediate and advanced menu settings and context sensitive help are available via a Microsoft Windows-style interface. TurboCAD Professional Edition is an advanced general purpose CAD product for design, drafting, detailing and modelling. It includes basic drawing and modification tools and tools for 2D or 3D design including 2D parametric constraints, 3D solid and surface modeling, robust photo-realistic rendering ray tracing, lighting and materials and extensive CAD and graphics file inter-operability. 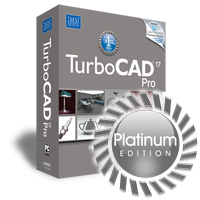 TurboCAD Platinum Edition is a comprehensive CAD product for 2D and 3D design, documentation, detailing and modelling. It includes all of the tools in TurboCAD Professional with the addition of advanced mechanical and architectural design tools. TurboCAD Mac Pro is a professional CAD application that includes 2D drafting tools, 3D surface modelling and ACIS solid modelling tools and more than eleven thousand symbols in an intuitive interface. Optimise drawing management with ability to organise layers into an unlimited number of sets and subsets, making it easy to turn on and off visual aspects and create detailed designs. TurboCAD Mac Deluxe 2D/3D provides snap to x, y co-ordinates capability for laying out floorplans and diagrams. The freehand spline provides maximum drawing freedom and the fair curve tool enables manipulation of spline circles, arcs or curves. 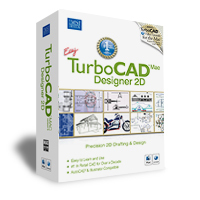 TurboCAD Mac Designer 2D provides drafting and design tools typically found in professional level CAD programs. TurboCAD Deluxe allows you to quickly create presentation-ready home plans, technical drawings, mechanical designs, artistic illustrations, crafts and school projects. Complete Set of 2D/3D Drafting, Design and Modeling Tools. TurboCAD employs a large selection of line, arc, curve, spline tools, and other expected tools, so that no matter the situation you’ve got access to the right tool for the job. When used with TurboCAD snaps, modification tools, and drawing aids you will be able to quickly draft and document your designs. Below is only a small sample of the drawing, modifying, and dimensioning tools. Box, Cone, Cylinder, Sphere, Wedge, Prism, Doughnut, Extrude, Helix, Revolve, Sweep, Mesh, Booleans And Splines. Angular, Baseline, Continuous, Datum, Diameter, Incremental, Orthogonal, Parallel, Quick, Radial, Rotated, String, Smart. TurboCAD Pro includes all the basic drawing and modification tools needed to draw nearly anything you can imagine. TurboCAD Pro's powerful tools for 2D or 3D design include 2D parametric constraints, 3D solid and surface modeling, robust photorealistic rendering ray tracing, lighting and materials, and extensive CAD and graphics file interoperability. TurboCAD Pro advances productivity with tools that allow for design, modification, presentation, and documentation in an integrated fashion. And because we know that most people use a number of tools or collaborate with others frequently, TurboCAD Pro is designed to provide excellent workflow to and from other applications. Open, insert, or embed up to 35 file formats and export up to 28, including .DWG, .DXF, .SKP (Google SketchUp), .3DM (Rhinoceros), .3DS (Autodesk 3ds Max), IGES, STEP, .OBJ, COLLADA (.DAE – export); vector formats including .EPS and .SVG; raster formats including .BMP, .GIF, .JPG, .PNG, .TIF. TurboCAD Pro reads and writes .DWG and .DXF files from R14 through 2010 including AutoCAD Architecture extensions. This broad range of support helps to maintain your intellectual property investment by supporting older files, models, and parts. It also makes it easy to access parts from vendors or posted on model exchange sites like the Google 3D Warehouse. TurboCAD Pro Platinum is our most comprehensive CAD product for 2D and 3D design, documentation, detailing and modeling. The Platinum product includes all of the advanced features necessary for both architectural design and more specific mechanical design tasks. 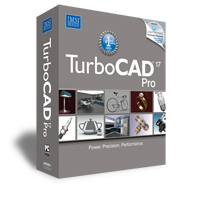 TurboCAD Pro Platinum functionality can of course be extended through one of the many plug-ins for TurboCAD such as Animation Lab, CAM, Furniture Maker, or the Beam Analysis Tool. In addition, there is a Software Developers' Kit (SDK) for TurboCAD Pro to allow you to create your own tools and customize behaviors. TurboCAD MAC PRO comes with the Lightworks Photorealistic Rendering Engine. Choose or customize any of the hundreds bitmap materials included, or apply any *.BMP or *.JPG images to your 3D models for optimal realism. Produce professional quality renderings of your designs by adding lighting, shadowing, reflectance, roughness and environmental effects. New Sketch rendering for stills and animations makes it easier for computer-generated models to look hand drawn. By avoiding the photo-realistic rendering look, artistic and emotional appeal can be brought out in the design. It is particularly appropriate in the early stages of conceptual design to avoid the feeling of completion. Sketch styles include: Cartoon, Color Wash, Contour, Hand Drawn, Hatch, Ink Print, Line & Color Fill, Line & Shadow, Mosaic, Oil Painting, Rough Pencil, Soft Pencil, and Stipple. TurboCAD Mac Pro takes your designs further. Primitives, complex and advanced surface tools, as well as surface modifiers and transformation tools are included for surface modeling. Skinned Surface - fits a network of NURB patches to a collection of curves that act as cross-sections for the final surface. Tube Suface – quickly and efficiently create a tube or pipe along a reference curve. Revolve Surface - This tool allows you to revolve a curve about an existing curve. Fillet Surface - blends two surfaces that share an edge or intersection. This tool does not extend surfaces. Draft Surface – This tool extends a surface to create a new surface attached to the end of the original surface. Net Surface - A net surface is not the same as a mesh. As the name implies, net surfaces are nurb surfaces. Net surfaces are nurb surfaces. A mesh is defined by nodes or 3D vertices. The Net Surface tool creates a surface defined by a grid of M rows and N columns, where M and N are letter identifiers referring to the number of rows or columns. Bend Solid - bends a solid about an axis through a given radius. The Trim Solid tool trims a solid with a curve, surface, or solid. The trim tool is usefulfor removing material from a base solid. In addition to trimming to surfaces or another solid, the trim solid tool has the unique ability to allow trimming a solid to a curve. Skinned Solids – Creates a solid from a collection of closed profiles. Create skin solids using profiles composed of individual curves (such as circles or ellipses) or grouped curves. A profile composed of individual curves does not have to be grouped for use with this tool. Polygon from Curves Tool – Draws a polygon with the number of sides determined by chosen points. History Free editing of your parts allows for tremendous flexibility in your design approach by allowing you to manipulate the individual components of a part without having to maintain a part tree which can be both time consuming and complex to manage. Assembly Connect - The Assembly Connect tool to connects one solid to another at a specified connection point. Assembly Mate - mates planar faces. You can specify an offset distance between mated faces. Assembly Align - aligns a face of two solid objects and supports cylindrical, spherical and planar faces. Assembly Insert - aligns and mates the faces of two solid objects. The align faces must be cylindrical and the mate faces must be planar. This tool is very useful for inserting bolts into holes. 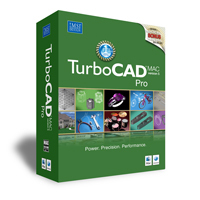 TurboCAD Mac Pro provides unlimited design options with its complete set of 2D tools. Choose from a number 2D drafting tools including line, arch, curve, circle, ellipse, and spline tools. Access text and dimensioning tools and 2D modifier tools like fillet & chamfer tools as well as 2D Transformation tools for easy editing. Fair Spline Tool - The Fair Spline command provides a tool to globally smooth a curve. Fairing a spline optimally moves control vertices to locations that minimize large curvature variations. Choose from thousands of parts and symbols to effortlessly add to your design including electrical, mechanical, bathroom, kitchen, construction, LAN, CMOS, doors, windows, counters, fasteners and HVAC. Use the symbols browser to quickly locate just what you need, enhanced to now display symbol filenames. Smart walls- TurboCAD Mac’s self-healing walls automatically join, intersect, intelligently to speed design. Additional Walls options include auto-dimensioning (applied as they are drawn), auto trim of wall vertices, and assignment of hatch patterns and colors. Parametric Doors & Windows– Choose from 3 door styles (Single, Single Standard, or Double) and 3 window styles (Overlapping Sill, Standard Sill and Tight Sill) to drag-and-drop into a wall, and TurboCAD Mac will automatically create an opening in the wall. In addition, users can offset the door or window a prescribed distance from the end of the wall for rapid and precise placement. Import or export from these popular formats: AutoCAD DWG/DXF, JPEG (export only), CGM (import only), Claris CAD (import only), PNG, ACIS SAT, Adobe EPS (export only), Adobe Illustrator, Adobe PDF (export only), IGES, PICT, TIFF, Rhino 3DM (import only), Spline (import only), STEP, TEXT, Truespace COB, DAT (import only), 3DS (import only), FAC (import only), BMP, STL, WRL (export only), 2D Raster. You can also use TurboCAD’s powerful batch conversion tool to batch convert a collection of drawings to other file formats. Use the page layouts to publish your design from up to 4 different view angles on a single page. New shaded view options for Page Layouts offer greater control of how the printed document will look. Users can also save designs as single or multi-page PDFs in standard or custom sizes for sending via email. A set of sophisticated surface analysis tools will help you maintain proper design integrity by providing critical information about your designs such as evaluating the smoothness of one or more surfaces, useful for identifying surface irregularities. Then choose from any of four curvature plot styles Gaussian, Mean, Min Radius and Max Radius. 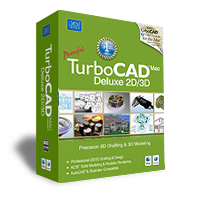 TurboCAD Mac Deluxe 2D/3D makes it easy to design anything. Snap to x, y coordinates to quickly layout floorplans, diagrams and more with the complete set of 2D design tools. The new freehand spline gives you maximum drawing freedom while the new fair curve tool lets you precisely manipulate any spline circle, arc or curve. Use the 3D surface and solid modeling tools to build accurate models that are easy to manipulate and quickly edit. Perfect for architects, illustrators, engineers. Speed design with over 11,000 pre-drawn symbols, or use the new block manager to quickly create, edit and manage 2D/3D blocks. Organize layers into new layer sets for optimal drawing management. Easily import existing designs from popular CAD and graphic design file formats, including AutoCAD DWG/DXF. Just as easily, export your precision designs and technical drawings from TurboCAD to other CAD formats, or choose a popular desktop publishing formats to create brochures or other marketing materials. Even print design to your specifications with new options for better control of how the printed document will look. TurboCAD Mac Designer 2D delivers comprehensive drafting and design tools typically found in professional level CAD programs. Created with the simple user interface every Mac user demands, TurboCAD Mac makes it easy to produce anything from simple sketches to standards compliant, production ready drawings. Import an existing CAD file in one of the many supported file formats, including AutoCAD DWG/DXF, or start from scratch. With intuitive design tools The Drafting Assistance’s snaps and alignment aids, 7,000 pre-drawn symbols, customisable keyboard shortcuts, automated user tips and online help, even beginners can quickly create precision designs. Adobe Reader v6 or higher. Macromedia Flash plug-in required for on-line tutorials. Microsoft Windows Vista and Windows 7 Aero display mode causes interference with the Redsdk GPU-accelerated display mode. If this option is selected, TurboCAD will turn Aero mode off for that session. It affects only the transparency of the application window border.